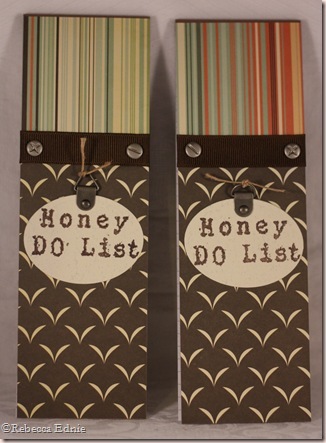 That always cracks me up, Honey Do List! I made these notepads for my craft show. I’m afraid there isn’t really anything interesting to say about these, they are pretty obvious. One thing I thought was cute, I used a + and a – screw. I know these screw head types have official names but to me they represent the positives and negatives of doing chores. You might hate doing them but you do feel mighty good when they are done! Paper: Earth Love-Cosmo Cricket, chocolate-SU!